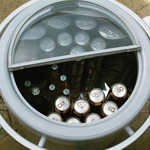 The Rolls Royce of Outdoor Fridges. It looks attractive, it’s discreet and it’s highly functional at the same time. Many inferior models of outdoor fridge have ugly plastic lids that fail with regular use. The lid on this is made from reinforced glass with further insulation round the circumference and split halves for easy access and to keep the chill in when being used. The split-halves are hinged to prevent the join between them from splitting over time. It has a 57 Litre capacity and will chill to minus 10 degrees so offers the perfect refreshment on a hot day every single time. The inner chamber is made of Stainless Steel and the compressor has a high quality specification for efficient cooling with low power consumption. The lockable wheels allow you to take the chill with you and the attractive side shelves with removable hanging trays offer extra space when needed. Can also be used for Dairy Products and Fruit – although it’s far more appealing when filled with refreshing drinks to fuel the party. If you have any further questions simply call our friendly Sales Team in the Midlands.